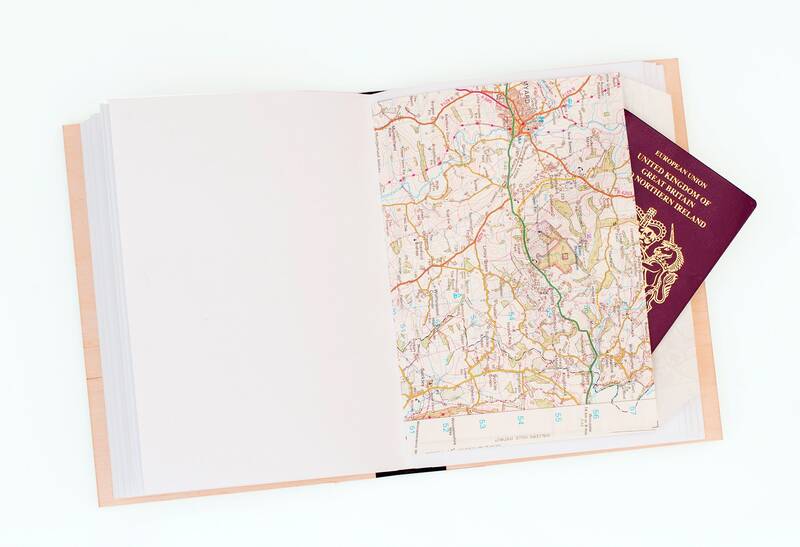 Whether you are about to embark on your first tentative steps into the world, or have been planning your perfect road trip for years, this beautiful A5 album is produced by hand and designed to work either as a travel journal, a lasting album for your treasured memories or as a journal or notebook to record your ideas. 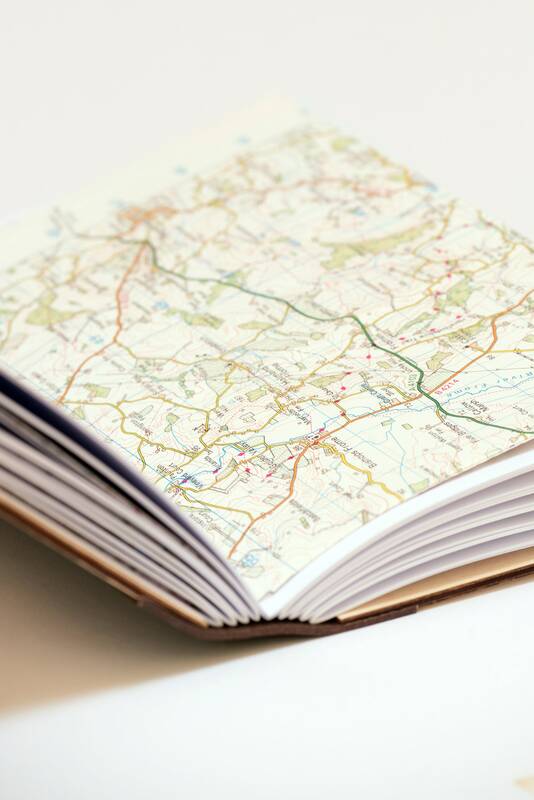 Containing 180 pages of plain white paper and interspersed with hand-made map 'pockets' this is the perfect way to preserve your memories, so that one day you can look back and share your amazing story. 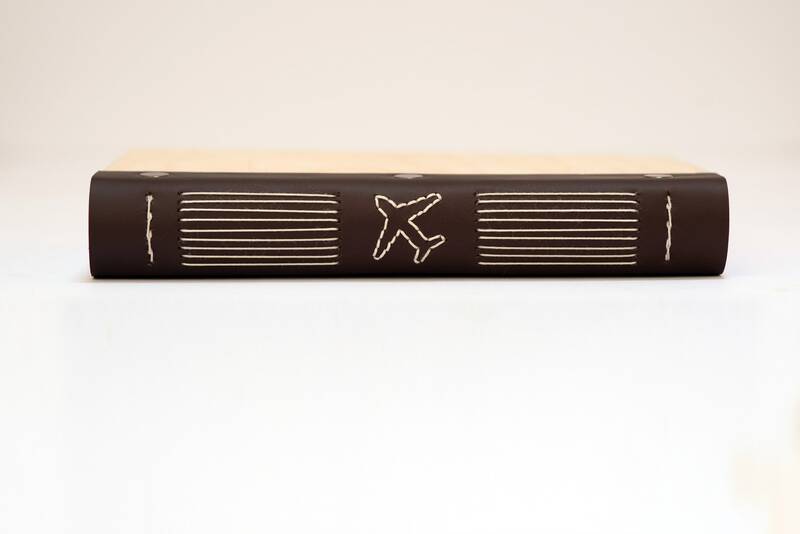 Integrated into the stitching is a vintage plane motif which sets the finished journal off beautifully. The album has a beautiful graphic print on the cover, with space for personalisation and dates if required. 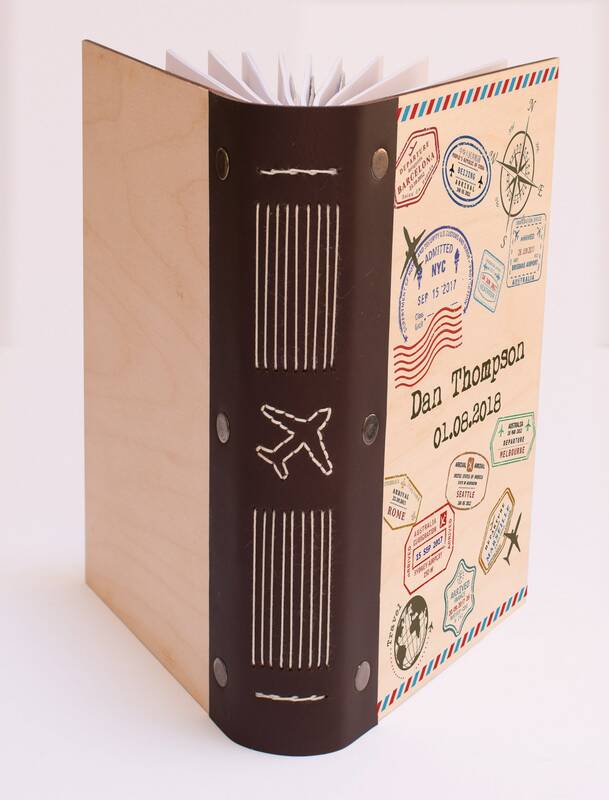 The inspiration for the cover design comes from vintage travel luggage from the heyday of global travel with a modern twist, and framed with the classic airmail flashing. 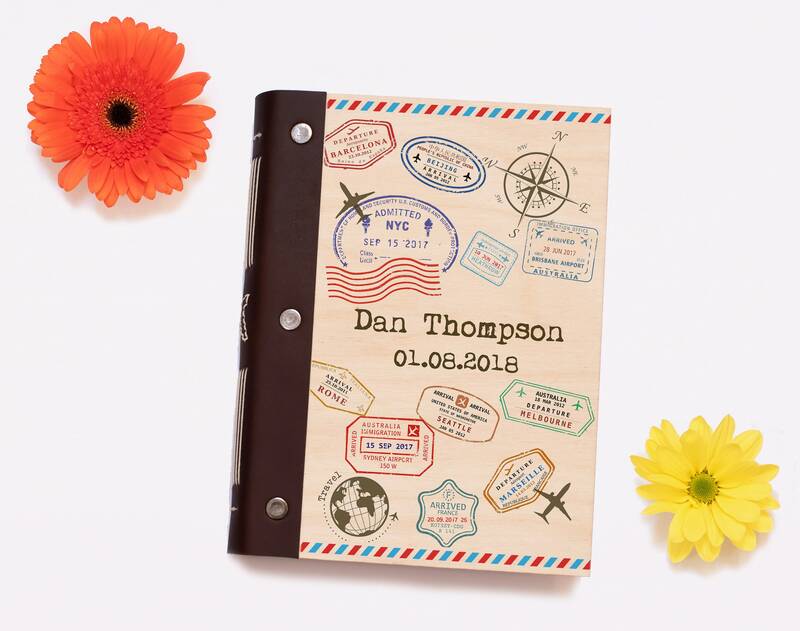 However, if you would rather any of our other Travel Journal designs on the front, we can do this too - or design one of your own! The album is produced using ethically sourced birch ply, bound with top quality leather, finished with gun metal rivets. Each book contains 180 pages of premium quality 120gsm cartridge paper, perfect for displaying your photos and also your notes or sketches (the paper has very good 'tooth' for pencil and charcoal sketching). 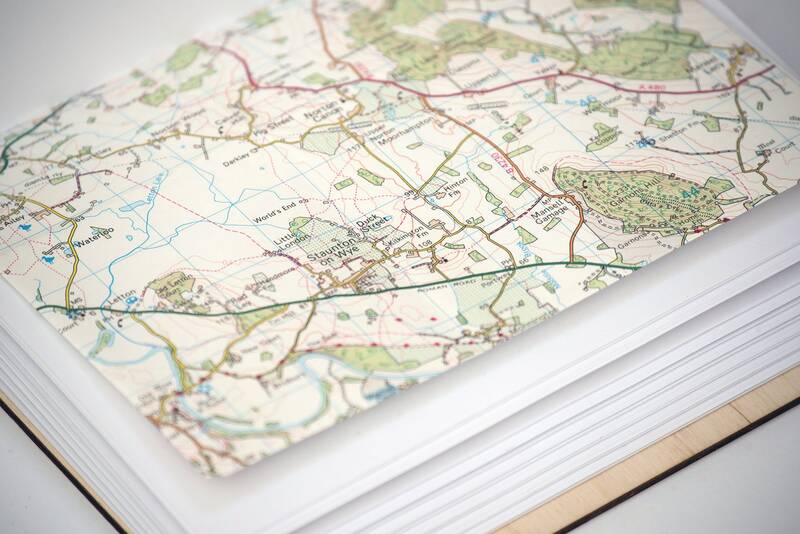 Each pocket envelope is hand made from vintage UK Ordnance Survey maps, and will vary in each book. If you would like us to use specific map, please use the drop-down option, but bear in mind this will add a week to the production time as we don't hold all maps in stock. The pocket envelopes are not sealed, but have a flap that will keep them closed while the Journal is shut and each of the nine map pockets are stitched into the binding. 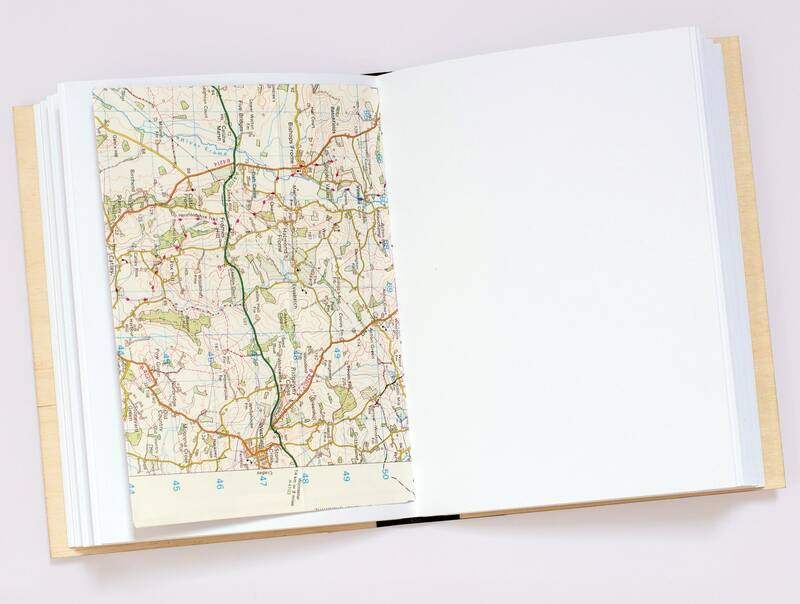 The pages are stitched into the leather using cream book binding thread, which allows the opened album to lie flat, making it a great choice for either a photo album or a journal. 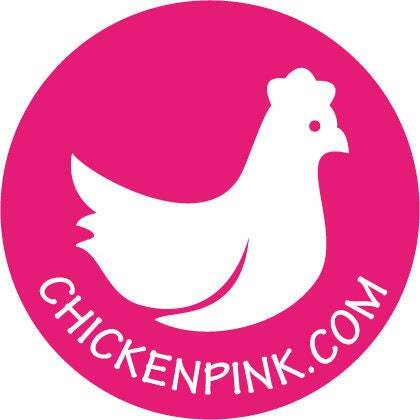 All Chicken Pink's personalised gifts are made to order, therefore the sky's the limit in terms of personalisation! If you would like anything specific designed especially for you, or just simply changing fonts / colours etc. then please don't hesitate to contact us. PERFECT and very well made. Just as described. My now husband loved it for his wedding gift--we used it as our travel journal through Europe on our honeymoon.